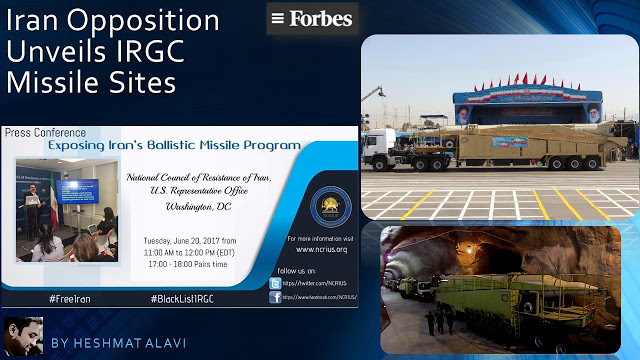 Iran has been pursuing an extensive ballistic missile program through dozens of very important sites, including twelve unknown to this day and one specifically linked to its highly sensitive and controversial nuclear program, the Iranian opposition National Council of Resistance of Iran (NCRI) revealed at a press conference Tuesday in Washington. The NCRI, citing sources of coalition member People’s Mojahedin Organization of Iran (PMOI/MEK) network inside Iran, in this case in Iran’s Defense Ministry & the Islamic Revolutionary Guards Corps (IRGC), has a history of blowing the whistle on Tehran’s ballistic missile program, nuclear weapons drive, terrorism and meddling across the Middle East and beyond, and human rights violations. NCRI US Office Deputy Director Alireza Jafarzadeh presented satellite imagery on the sites and details of North Korean experts who took part in the construction of such highly essential centers. Iranian Supreme Leader Ali Khamenei demanded the acceleration of missiles production and tests following the nuclear deal signed with the P5+1 and specifically tasking the IRGC Aerospace Force to realize this objective. Four of Iran’s most important missile sites are located in the cities of Semnan (east of Tehran), Lar (southcentral Iran), Khorramabad (western Iran) and near Karaj (west of Tehran), according to the PMOI/MEK sources. Iran has only acknowledged the existence of two of these sites to this day. The NCRI revelation comes at a sensitive timing as the US Senate levied extensive new sanctions on Iran covering particularly its ballistic missile program, and support for terrorism and human rights violations. All factions of the regime in Iran are fully supportive of their drive to upgrade their ballistic missile program, considered a critical aspect of the mullahs’ national security framework and foreign policy. “We will have a new ballistic missile test in the near future that will be a thorn in the eyes of our enemies,” Iranian President Hassan Rouhani boasted recently. The region is currently engulfed in escalating tension as Iran launched six medium-range ballistic missiles targeting ISIS in eastern Syria on Sunday. Adding to the list of turmoil, the US military shot down a Syrian regime Su-22 fighter jet near the city of Raqqa for dropping bombs on US-allied ground forces. This is a first for Washington in the six-year long multi-faceted Syrian conflict. This increase in foreign crises, parallel to Iran’s powder keg society causing major dilemmas for the mullahs as protests elevate across the country, will be a major issue of discussion in the upcoming NCRI annual convention scheduled for July 1st in Paris. Evicting the IRGC and all affiliated proxy militias from Middle East countries, specifically Syria and Iraq.